Some days I just want to let go, want to think above and beyond all parameters of life. A day where all I do is just reflect, absorb and bottle up energy. This boho outfit with lace top and relaxed plazzo is what represents such days. Days months and years pass in just keeping up with the pace of time and keeping everything together so that our little world remains intact. But in these times, it's always good to spare out a day or two to just to yourself, to visit all these little corners of heart that have not been visited in ages. To open up windows that have got rusted and to bring out thing that have just been collecting dust. Not trying to day that it's not good to run with the seconds hand of click but to keep doing that without loosing yourself you need to rewind. This outfit represents freedom, to just live life in one's own style. You know you look the most beautiful when you are you . As living in a set pattern is not ideal, same way just going my trends blindly will not make you look prefect. 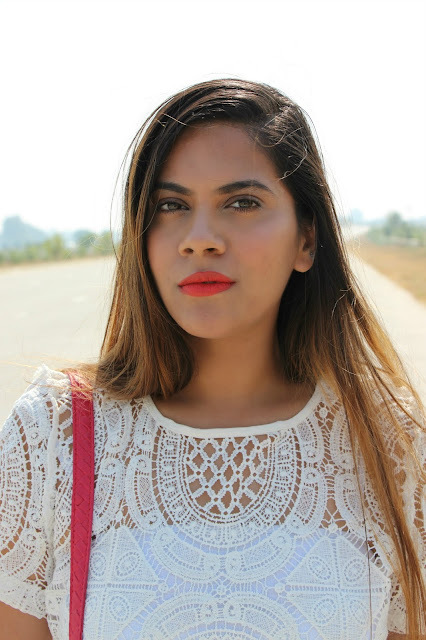 On my unwinding day I wore this beautiful and elegant lace top from DealSale which totally represents me and paired it with Limeroad Plazzo which I got as an experiment and it turned out to be a successful one. I am totally feeling this boho outfit, it has that free spirit that I want. I really like those pants, they are perfect with the lace top! Il top mi piace molto. Il bianco ê un colore che ultimamente mi sta piacendo troppo. I love the plazzo and in fact, have such a pants in my collections. The blouse is good match for the plazzo. Amazing, i love these pants and your lace top!!! love your top perfect on these wide pants! Such a lovely top <3 You've styled it very well! Love your style Pooja.. Palazzos are so comfortable.. I too love them..
wow.. such a quniqe and stylish look! A very comfy but chic look! Look fantastic, I love the lace blouse and shovel. Great post, yes it is good to take some time to reflect on your own life and emotions. Love the white boho outfit. What a beautiful lace tunic. I love the lipstick you chose too! Très jolies photos... Une tunique magnifique. The lace top looks very pretty.